affected by our use of it when boating. For obvious reasons the greenest form of boating is the use of a canoe, kayak, raft or sailboat. Folks who use these types of watercraft are making no negative impact on the environment as long as they are being good stewards of the waterway in other respects (and most of them are). Paddling or sailing is not always practical for some people so the use of powerboats is necessary and enjoyable. 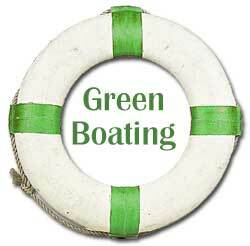 There have been great improvements on marine engines and boats in the past 10 years that have caused them to be much greener. 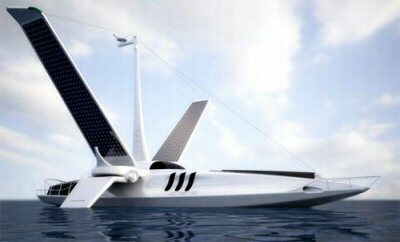 There are some boat designs that can more efficiently use solar and wind power like the ones shown here. There are things that we can do with less investment to help make power boating more environmentally friendly. Prevent oily discharges from the bilge. Keep your engine well tuned to prevent fuel and oil leaks. Secure an oil absorbent pad or pillow in your bilge and under your engine where drips may occur. Check the pads often, do not let them clog the bilge pump, and dispose of them as hazardous waste at a marina or local hazardous waste collection center. Spill-proof your oil changes. For oil changes, use an oil change pump to transfer oil to a spill-proof container. Wrap a plastic bag or absorbent pad around the oil filter to prevent oil from spilling into the bilge. When fueling, stop the drops! Prevent fuel spills by filling fuel tanks slowly and using absorbent pads or rags to catch drips and spills. Do not "top off" or overflow your fuel tank. Leave the tank 10% empty to allow fuel to expand as it warms. Do not add soap. Never use soap to disperse fuel and oil spills. It increases harm to the environment, and it is illegal. Minimize boat cleaning and maintenance in the water. If possible, save maintenance projects for the boatyard. When performing work on the water minimize your impact by containing waste. Use tarps and vacuum sanders to collect all drips and debris for proper disposal. Reduce toxic discharges from bottom paints. Minimize the discharge of heavy metals found in soft-sloughing antifouling paints by using a less toxic, or nontoxic antifouling paint. Use only non-abrasive underwater hull cleaning techniques to prevent excessive paint discharge. Remember, dry storage reduces the need for antifouling paints and saves money. Dispose of hazardous waste properly. Dispose of paints, batteries, antifreeze, cleaning products, oil, oil filters and other hazardous wastes at a hazardous waste collection facility. Plan A-head! Manage sewage wastes properly. Never discharge sewage within 3 miles of shore. Use harbor pump-out stations and shore-side facilities. If you do not have an installed toilet, use a port-a-potty and empty it at a harbor dump station or bathroom. Stow it, do not throw it! Keep your trash on board. Never throw cigarette butts, fishing line, or any other garbage into the waterway. Take advantage of shore-side facilities to recycle plastic, glass, metal, and paper. Reduce Greywater discharges. Use a phosphate-free biodegradable soap to minimize the impacts of greywater on the marine environment. Also minimize discharge by doing dishes and showers on shore whenever possible. Choose green products: Use the cleanest maintenance products that do the job. Look for the EPA-certified "Design for the Environment" DfE label, which assures you that the product has minimal environmental impact and is safer for the person using it. Benefit: Safer products. Reduce water pollution. Don't push water: Install and use trim tabs or hydrofoils. Most planing powerboats can improve hole-shot acceleration or reduce fuel consumption with properly adjusted trim tabs and hydrofoils. Keeping on a plane at lower engine RPMs can extend your range and reduce your time on passages. Benefit: Improve boat performance and save gas. Retire that 2-stroke outboard: It may be possible to get a few more years out of your old-technology outboard, but you'll be much happier with the reduced noise, fumes, fuel consumption, and pollution of a modern injected four-stroke outboard. Recycle your lead-acid batteries: 12V batteries are among the most recycled products in the world. Get up to a $10.00 credit on a new battery, when you return your core to any West Marine store. Benefit: Save money and conserve resources. The untreated discharge from one weekend boater puts the same amount of bacterial pollution into the water as does the treated sewage of 10,000 people. Human wastes can contain disease-causing organisms such as bacteria, viruses and parasites. Swimmers, waterskiers and others who swallow or come in contact with water that has been contaminated with human wastes can become ill. Dirty boat bottoms can carry hitchhiking pest organisms from bay to bay, port to port - pests that can harm the very things you value. Go for the washpad: If you are going to pressure wash you own boat, ask your marina where the best place is. Many marinas have washpads designed to prevent contaminants from entering the water. If none is available or if you are at home, use a tarp under the boat to capture any debris. Also try to use an environmentally friendly soap when washing down the topsides before you put her away. My old 22ft deckboat was sluggish, the motor smoked, it was not reliable and worst of all it used a lot of fuel. I wanted to keep the boat so changes were needed to make it "greener". The first and most expensive step was to replace the old 2-stroke 115 horsepower motor. New technology and clean air legislation has brought about changes in outboard motors. 2-stroke motors are still being manufactured like the Evenrude Etec, that meet all modern pollution standard and are very efficient. The most popular new motors are 4-stroke. They are fuel efficient, quiet and low emission motors. I purchased a new Mercury 4-stroke 115 horsepower motor with electronic fuel injection. This motor is a little heavier than the old motor but the boat could easily handle it with other weight reducing improvements that I made. The big improvement in weight came about because I needed to replace the rotting floor in the boat. When I tore it out I discovered that most of the flotation foam was saturated with water. I removed hundreds of pounds of wet foam from the boat and replaced it with new closed cell foam. Not only did this reduce the boat weight but it insured that the boat would not sink. When I built a new floor, I made certain to seal it so that water would not accumulate under it again. The hull of the boat was in surprisingly good condition, considering that it had spent several years docked on the river but it did have an accumulation of "gunk" built up that created more resistance to the water, while underway. This was also a fuel burning issue. With a great deal of effort I cleaned the hardened gunk off the hull and polished it. 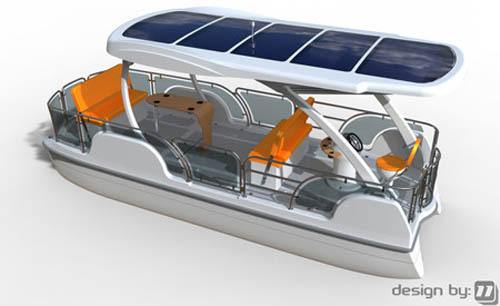 A boat hull that slides through the water easier uses less fuel than one that is bumpy. I used to use a gas generator when I spent the night on the boat or camped along the shore. It was used to re-charge gadgets, cook with a hot plate, make coffee and even light up the area. The generator was noisy, heavy and used fuel. I replaced cooking and coffee making items with propane and campfires. I also replaced many electricity-using items with ones that run on 12 volts and for those that I could not I purchased a small inverter that would run 115 volt AC items on 12 volts DC. After adding a second battery I installed an isolator to the boat motor that would charge this second battery while underway (after the cranking batter is fully charged). Many other minor improvements were made that added to the efficiency of the boat. When finished I had a boat that was not only reliable, smokeless, faster and more fuel efficient but I felt good about making it into a "greener" boat. The big bonus for this came with fuel savings. I take long trips on the rivers and before I made these changes the boat (heavily loaded with fuel, water and gear) averaged about 3mpg. Now with the same onboard weight the average is 6.7mpg. Repair leaky faucets and running toilets right away. Leaks can waste as much as 50 gallons of water a day. Don’t run the faucet when you are brushing your teeth, shaving, or washing dishes. This can waste 3-5 gallons every time you run the faucet. Install low flow toilets to save 3-5 gallons per flush. Install water saving showerheads. Outdated showerheads can waste 20 gallons of water a day. Don’t run your dishwasher or washing machine unless they are full. Water your lawn or garden in the early morning or evening to avoid water loss due to evaporation. Never dump oil, anti-freeze, paint or any other chemical or pollutant down the storm drain. Take them to you local hazardous waste disposal site instead. Most storm drains go directly to our rivers where oil and paint can kill fish, birds and other wildlife. Compost or recycle your yard waste and minimize your use of fertilizers and pesticides on your lawn and garden. Any yard waste or pesticides that are washed off your property and down the nearest storm drain will usually end up in your local river. Plant a rain garden on your property to minimize the amount of stormwater runoff that leaves your property and washes down the stormdrain. Rain gardens also help reduce the amount of water you need to use to water your plants. Don’t flush expired and unused medicines down the drain or toilet. Your local sewage treatment plant does not have the technology needed to remove these chemicals from the waste water, and most of them are then discharged to our rivers where they can harm fish and other aquatic life. Take them to your local hazardous waste disposal site instead. Use environmentally friendly house hold cleaners like phosphate free detergent in your dishwasher. Properly maintain your septic tank and fix any car leaks right away. Both can be sources of pollution that end of up in your local river. Be considerate of fish, wildlife and other people. Never leave behind any trash or leftovers from your river trip or throw any trash in the river that could harm wildlife or ruin the view for the next visitor. If you find someone else’s trash, take it with you. Keep noise levels down to avoid disturbing wildlife and people. Carry any water you need in reusable hard plastic water bottles. Most commercially bottled water comes from rivers, aquifers or even the tap, and the disposable water bottles are wasteful and frequently discarded improperly. If you pull over on a river bank or sand bar, try to disturb as little wildlife habitat as possible. Travel on established trails and leave everything as you found it. Report unusual smelling water, discarded barrels that appear to be leaking or illegal dump sites to your nearest EPA office. Retrieve any snagged or broken fishing equipment before leaving. LEAVE NO TRACE THAT YOU WERE THERE!